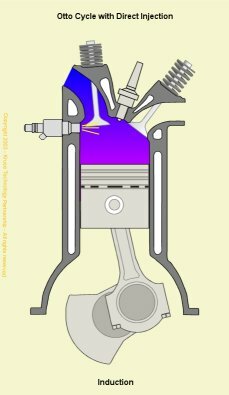 The theoretical Otto Cycle process is the same for both indirect and direct fuel injection methods, but the efficiences gained by using direct injection are bringing the practical application closer to the theoretical. 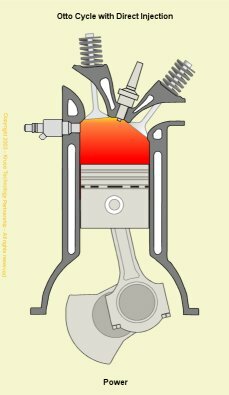 Direct injection means that there is a total separation between the air and fuel required for combustion. 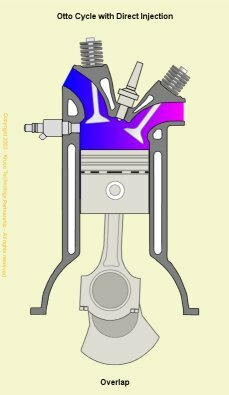 This allows precise control over the quantity of fuel and the time in the cycle it is introduced into the cylinder. 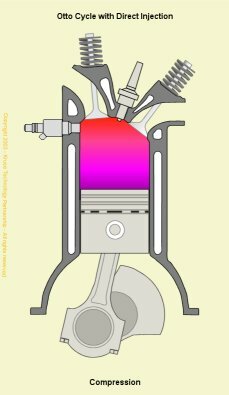 Thus, for maximum power (in similar manner to that of a port injection system), it is possible to inject a full quantity of fuel in the induction stroke, while for low load, maximum economy (lean-burn) operation it is possible to inject a smaller quantity of fuel during the compression stroke. Although lean-burn is implemented with indirect injection, the lean-burn misfire limit (point at which misfire occurs) is governed by the leaness of the fuel/air mixture in the cylinder. 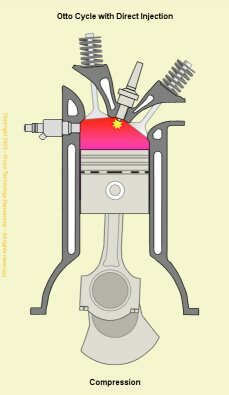 This limit is lowered in direct injection, spark ignition engines, as the fuel spray is directed towards the sparking plug to ensure that there is a chemically adequate mixture around the plug when the spark occurs. 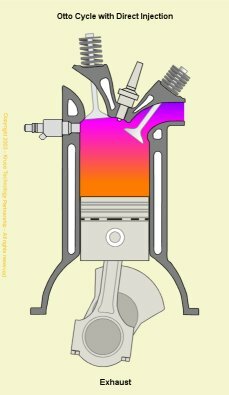 Fuel will normally have been directly injected into the cylinder during the induction stroke, but as described above to achieve lean-burn economies, this may be delayed until late in the compression stroke.